Retractable curtain shades roll up and down, providing a neat and simple window covering with little to no overhang. If an understated but functional window covering is the goal, a retractable shade is the way to go. 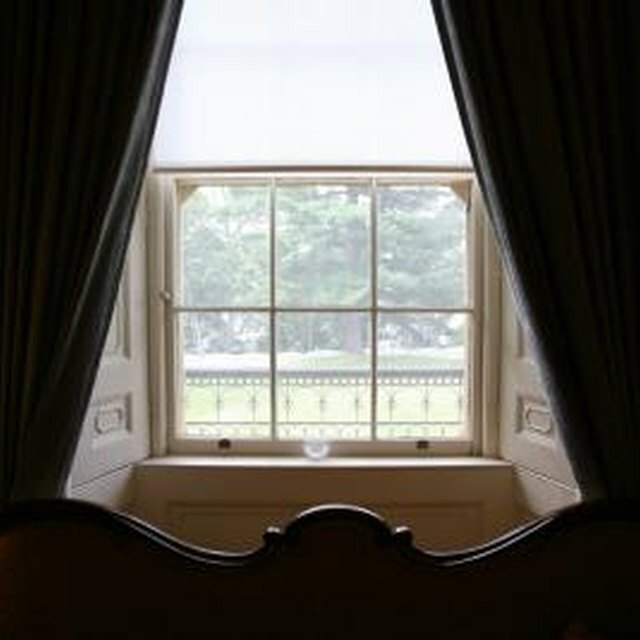 As long as the appropriate hardware has been purchased, curtains can be made to match any décor. A heavy, home décor fabric is best because it will hold the bottom curtain rod without tearing a seam. Measure the length and width of the window frame. Measure out a piece of fabric that is 2 inches wider and 8 inches longer than the frame. Cut out the fabric and iron it flat. Fold the fabric over on both sides of the panel by one-half inch toward the underside of the fabric. Iron the hem flat. Fold the hem over again by one-half inch and iron it flat. Pin the hem in place. Sew the side hems with a one-eighth-inch seam using straight stitch on normal tension. Fold the bottom of the fabric up by one-half inch toward the underside of the fabric and iron it flat. Fold the hem up another 3 inches and iron it flat. Pin in place and sew using a straight stitch on normal tension with a 2-1/2-inch seam. Fold the top of the fabric over by one-half inch toward the underside of the fabric and iron it flat. Turn the hem over again by 3 inches and iron it flat. Pin in place and sew using a straight stitch and normal tension with a with a 2-1/2-inch seam. Slide the finished panels onto the retractable curtain rods, then place the rods into the shade’s hardware.